In conjunction with Outwell we are offering this great promotional deal – buy 1 Outwell Flocked Excellent Double air bed and 2 x Outwell Flocked Excellent single air beds and get an Outwell 12V Sky Pump absolutely FREE!. 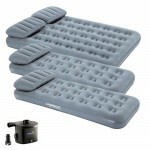 For those who want a bit more from their airbed, then the Excellent Range is for you. 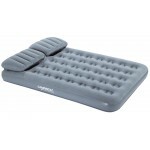 These airbeds are much deeper and slightly longer/wider than the standard airbeds and have a stabilising edge construction making these beds more rigid and much more like your mattress at home. 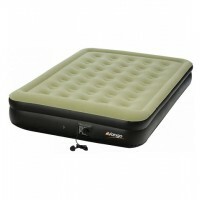 These airbeds still come with a soft velour 'flocked' cover on tough PVC base, for both comfort and durability. Double Dims. 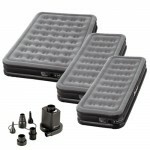 195x135x26cm; Single Dims. 205x80x26cm. The Outwell Sky Pump is a 12v/230v pump supplied with 5 different nozzles (bit like a Hydra). 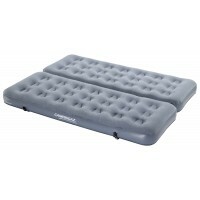 Will both inflate and deflate your airbeds. 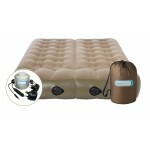 Outwell Flocked Excellent Airbed Deal - 1 Double + 2 Single with FREE Outwell Sky Pump.